The Land Reform and Biodiversity Stewardship Initiative (LRBSI) is a conservation and developmental initiative run in a tri-partnership by the Department of Rural Development and Land Reform (DRDLR), the Department of Environmental Affairs (DEA), and the South African National Biodiversity Institute (SANBI). To establish a network of learning communities and communities of practice focusing on land reform, communal lands, and biodiversity stewardship. To demonstrate the successful delivery of socio-economic and conservation benefits (e.g. poverty reduction, historical redress in South Africa, land development, integrated rural societies) at a project level. 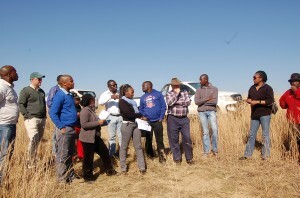 The LRBSI was started in 2008 to meet the challenges faced by the conservation sector within the context of land reform, rural development and equity imperatives in South Africa. By December 2009, a suite of 17 pilot projects were identified round the country for this initiative. To date, there are about 22 projects in the LRBSI portfolio.